Demonstrators have been marching in their tens of thousands across the continents to demand a halt to the US-led military operation in Iraq. Banner-waving protesters streamed through the streets of Rome while in Seoul they clashed with riot police trying to keep them away from the US Embassy. "It's more urgent and more important than ever that there be a mobilisation, only the focus is 'No' to colonial occupation," said protest organiser Sara Flounders in New York, ahead of a rally there. America's capital, Washington, saw rival rallies on Saturday by protesters and supporters of the war which is into its fourth week. The war may be drawing to a close, the BBC's Jon Leyne reports from the city, but the arguments continue about the rights and wrongs. About 5,000 supporters of the war waved their flags in the shadow of the Capitol building as speakers railed against the United Nations, the liberal media and the enemies of America. A short distance away, peace protesters assembled to campaign against the "colonial occupation of Iraq". Our correspondent says numbers are down on pre-war protests but the protesters' determination is as strong as ever. 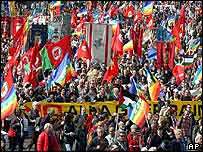 Correspondents say the biggest anti-war rally was in Rome, where organisers put the turnout at more than 100,000 and police gave a figure about half that. A few of the protesters, who included anti-globalists, vandalised buildings during the march, hurling red paint at banks and other businesses, but police did not intervene. "We can't accept a government that creates policies that will slowly bring war to Europe because, slowly but surely, there will be more terrorism here in Europe as a result of this war," marcher Marco Ramazzotti, a 55-year-old humanitarian aid consultant, told AP news agency. 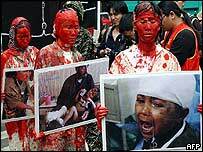 In the South Korean capital, Seoul, riot police wielded truncheons and sprayed fire extinguishers at protesters chanting slogans against "the war-mad United States", who fought back with sticks. Police buses had their windows shattered in the scrum which left at least two protesters injured.